Our mobile devices are always by our side and often get blamed for adding stress to our everyday living, but with the right apps in tow, our phones can actually help us rediscover some inner-peace and tranquility. With that in mind, here are some of our favorite calming apps for iOS and Android. Address Stress combines both breathing exercises and a variety of relaxing sounds to give you a safe and calm place to retreat to. The free version offers two-minute and 10-minute exercises, and if you pay up for the full version you can access the extended 14-day programs for even more mindfulness. This one is great for someone who wants to maintain a regular schedule of meditation. Breathe2Relax takes a more physical approach to relax your body, giving you a series of exercises designed to control your breathing and reduce stress in every muscle. The app lets you tweak the exercises to fit in with your own personal breathing patterns, and there’s a limited form of feedback included so you can chart your relaxation progress. The appropriately named Calm provides you with meditation courses to cover a week or three weeks and help you take life at a slower pace. You can pick your own combinations of nature scenes and specially commissioned meditation music tracks, and with sessions lasting anywhere from two to 30 minutes you can dip in whenever you get the chance. Headspace is an app that eases you gradually into meditating regularly with a challenge to take 10 minutes out of every day for 10 successive days. Presumably, if that works for you then you’ll want to go deeper into the app’s various range of courses, which in total cover hundreds of hours’ worth of meditations (though you need to pay to unlock each one). From white noise to coffee shop clatter to the sound of rustling leaves, Noisli lets you set up a customized wall of background sound. You can use Noisli to help you focus, boost productivity, or yes, just chill out as well. The app lets you save particular combinations of sounds (rain, wind, trees, and so on) and the audio feeds can work offline as well. Smiling Mind is backed by a not-for-profit organization that wants to make meditation and mindfulness available to all, and the app certainly delivers on that score. There are programs for all ages, and meditations of various lengths, plus the opportunity to track your progress over time towards that unshakeable calm you’ve been searching for. One of the most appealing aspects of this app is the speed with which you can dive in and get started. In just five minutes you can be bringing some peace and calm to your day, and as you progress through the app’s various exercises (a lot of which are free) the integrated self-assessment feature in the form of short surveys helps you work out if the app is actually effective. The Mindfulness App is neatly laid out, packed with dozens of meditations (both free and paid-for), and comes highly recommended by the majority of people who’ve used it. The app’s exercises are flexible enough to fit in to any schedule and it can even remind you to take a time out each day. This is easily one of our favorites because it’s so easy to use. You might not think the sounds of a thunderstorm can foster mental tranquility, but let Thunderspace 5k work its magic on you and you might change your mind. Apparently it produces a “3D audio sound field” through stereo headphones for a fully immersive effect, and there’s a visual component to make use of too, complete with lightning flashes. A simple but elegant meditation app that takes its inspiration from the humble Tibetan bowl, an object long associated with relaxation and mental health. 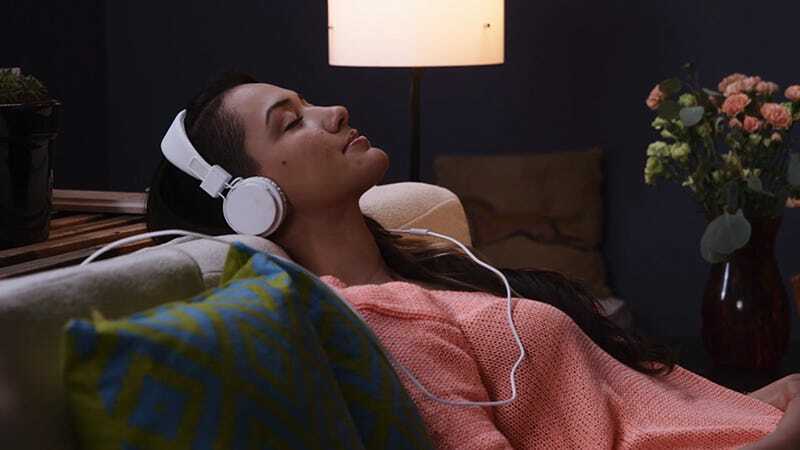 Let the soothing sounds of the various traditional instruments send you off to sleep or just create a peaceful oasis in the midst of the day (there’s a built-in timer that can slowly decrease the volume for you). If you’re a believer in the therapeutic and calming effect of white noise then give this app a go. In the free version there’s a choice of more than 40 looped sounds (from “boat swaying in water” to “frogs at night”) which you can combine as you wish. Alarm and timer systems are included so you can wake up or fall asleep to your favorite set of background sounds.